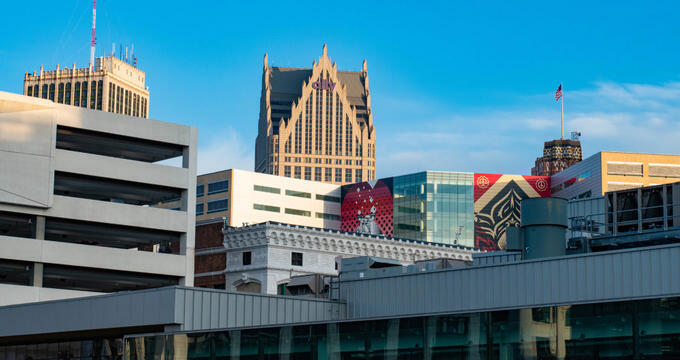 Detroit has long been known as a destination for great food, from traditional meat-and-potatoes joints to upscale Italian and French fine dining destinations. These restaurants, food trucks, and nightlife spots rank among the city's best places to treat a date to fine and casual fare, offering unique ambiance, shareable plates, and well-paired wines and cocktails. Selden Standard is a New American small plates restaurant with a focus on seasonally-available and locally-sourced ingredients, opened in 2014 by three-time James Beard Finalist chef Andy Hollyday and his business partner Evan Hansen. The Midtown restaurant has won several awards, including Restaurant of the Year honors from the Detroit Free Press and the Detroit Hour. It prides itself on serving creative fare in a rustic and open setting, with a frequently-changing menu that highlights vegetables, meats, and seafood. A carefully-sourced drink menu also features options from small producers of wine, draft and bottled beer, cocktails and sake. Townhouse opened in downtown Detroit in 2015 with a focus on high-quality comfort food and premium drinks. The large restaurant features a 300-seat dining room, a wraparound patio with a fire pit, two large bars, and a whiskey lounge, serving brunch, lunch, and dinner at all areas. The bistro is best known for its award-winning Townhouse burger, made from a blend of premium steak cut and served on a homemade brioche butter roll. Other notable menu items include sushi, appetizers, large customizable salads, and an inventive dessert selection, which can all be paired with drinks from its wide selection of cocktails, wines, draft beers, and top-shelf liquors. 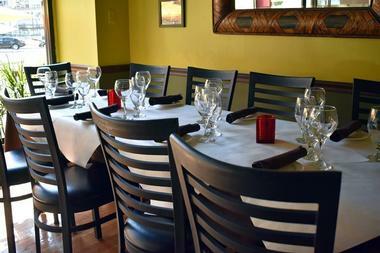 Visitors should note that reservations are highly recommended, especially for dinner service. Grey Ghost is named after a legendary Prohibition-era Detroit rum runner, dedicated to offering Detroit's finest craft cocktails paired with a variety of inventive dishes. The bar was opened in 2016 by a team consisting of brothers John and David Vermiglio and business partners Joe Giacomino and Will Lee, operating today out of the historic Bush Park neighborhood. 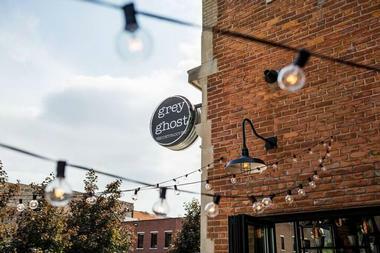 Grey Ghost offers unique meat and seafood dishes such as fried bologna and waffles, smoked mussels on toast, and shrimp dumplings, served alongside a drink menu that includes creative cocktails, craft beer, and wine. Weekend brunch is also offered, pairing breakfast cocktails with a full menu of meat, egg, and pastry-based dishes. 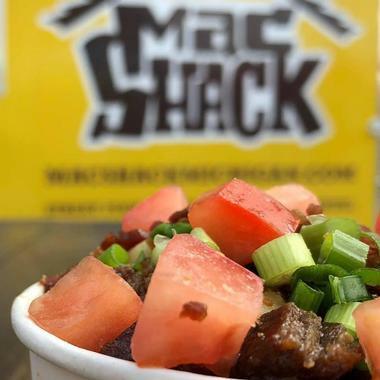 Mac Shack, owned by Ben Beazley and Bryan Sutton, is one of the most popular food trucks in Detroit, dedicated to crafting a variety of speciality macaroni and cheese recipes. It is known for its classic mac and cheese entree, which is offered alongside a variety of flavors, including buffalo mac, mushroom mac, and bacon mac options. Fried mac and cheese balls are also served, along with a selection of clever French fry options. The truck travels to destinations throughout the Detroit metro region while maintaining a permanent home at the Detroit Fleat Food Truck Park and Boozery, the city's only devoted food truck park. Customer seating is offered when the truck is parked at Detroit Fleat, along with access to a variety of additional food truck vendors and alcoholic beverage vendors to complement meals. Iridescence is an award-winning AAA Four-Diamond restaurant that was added as part of the 2008 expansion of Detroit's Motor City Casino and Hotel, which was originally opened in 1999. The 16th-floor restaurant offers sweeping views the city's downtown skyline and boasts an extensive award-winning wine list paired with New American fine dining options and signature desserts. Menu highlights include unique dishes such as South African lobster tail, lamb belly ragu, and osetra caviar. A la carte choices are also offered, along with both four-course and five-course tour tasting menus with optional wine pairings. During happy hour, discounted drinks and exclusive small plates are offered at the restaurant's elegant bar. Giovanni's is named for owner Frances Truant's father and got its start as a takeout pizzeria in 1968, transforming into the fine dining Italian establishment it is known as today through Truant's dedicated renovation vision throughout the 1970s. The classic restaurant is now operated by Truant's wife Frances and her son, executive chef Randy Truant, and has seen its share of famous guests over the years, including celebrities such as Frank Sinatra, Celine Dion, George Clooney, and Jack Nicholson. The menu features authentic Italian fare such as homemade pastas, fresh fish, locally-sourced vegetables, and prime cuts of meat, served alongside a speciality wine list and a seasonal dessert selection. 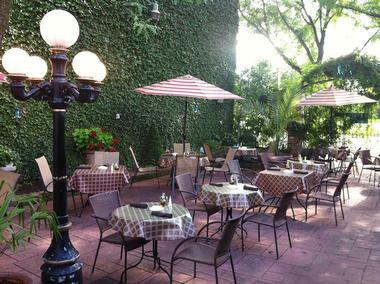 La Dolce Vita is an authentic award-winning Italian restaurant opened in 1995, known for its beautiful garden patio, lively nightlife, and one of Detroit's best brunch offerings. The restaurant features live music during its weekly brunch sessions and hosts DJs every Tuesday for its late-night patio dance parties. Once a month, it famously invites diners to wear their pajamas to Sunday brunch. Dinner offerings include classic Tuscan-style pastas which can be ordered gluten-free, well prepared meat and seafood dishes, and a variety of homemade dessert and wine options. In addition to weekend brunch and dinner service, the restaurant also offers full lunch service on weekdays. Roast is an award-winning steakhouse from famed Iron Chef Michael Symon, located within the downtown Westin hotel and opened in 2009. 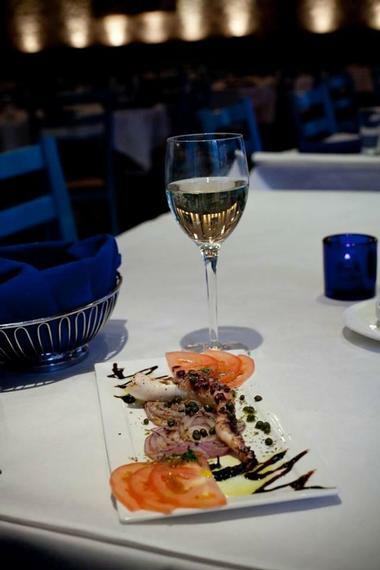 The 200-seat restaurant is known for expert meat and seafood preparation in its Mediterranean-influenced entrees and has earned the prestigious Restaurant of the Year distinction from the Detroit Free Press. It menu is focused on steak dishes, though it also highlights a variety of lamb, chicken, lobster, and seafood entrees alongside a full bar menu of wine, mixed drinks, and draft and bottled beers. For guests looking to dine in a more intimate setting, Roast offers two private dining options that must be booked in advance. London Chop House was established in 1938 by Lester and Sam Grubber and has been named among the top 10 best restaurants in the nation by the James Beard Awards. Though the restaurant was a Detroit classic throughout the mid-20th century, drawing many famous patrons and receiving national acclaim, it fell on hard times during the city's late-2oth century decline and closed its doors in 1991. In 2012, it reopened in its original location under new management, with a menu that pays tribute to classic London Chop House offerings, adding inventive new touches to celebrate the establishment's modern era. 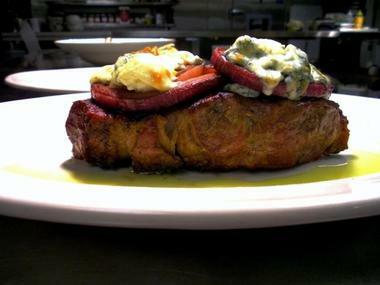 Premium well-prepared cuts of steak are served on its dinner menu, along with fish, chicken, and lamb entrees. A first-floor bar and cigar lounge also provides after-dinner drinks and cigar service. 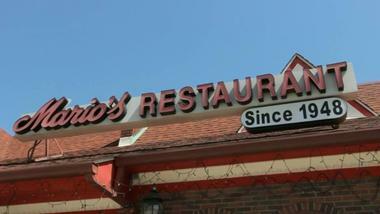 Mario's is a classic Italian restaurant opened in Detroit's theater district in 1948, offering an authentic supper club experience and weekend dancing. The restaurant is known for its elegant atmosphere, offering vegetable and relish tray starters to compliment tableside cooking. Menu favorites include authentic European dishes such as shrimp scampi, chicken cacciatore, and veal parmigiana, served up alongside an expansive wine list and rotating dessert offerings. On the weekends, ballroom dancing and live entertainment are offered. Additionally, the restaurant offers valet service and shuttle service to nearby theatrical venues, making it a popular before-show dining spot. Guests should be aware that reservations are highly recommended and that adherence to an upscale dress code is appreciated. 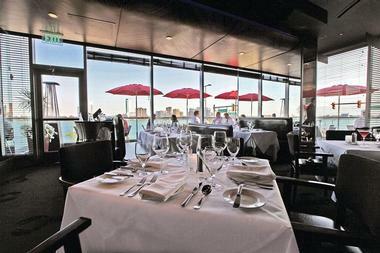 The Rattlesnake Club is a fine dining restaurant opened in 1988 along the waterfront of the Detroit River, offering views of both downtown Detroit and the shores of neighboring city Windsor, Canada. 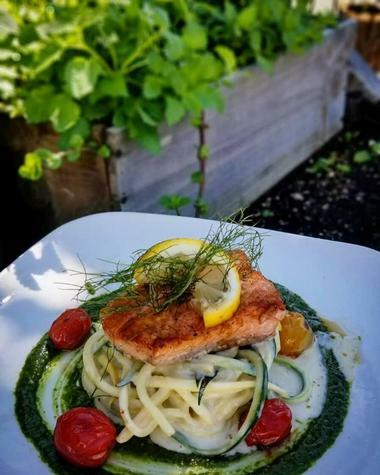 The restaurant offers weather-permitting outdoor seating on a garden terrace, serving up a menu highlighting locally-sourced, sustainable, and seasonal ingredients. A variety of meat and vegetarian entrees are available at dinner service, including Certified Angus beef and seafood entrees, pastas, and vegetable dishes. 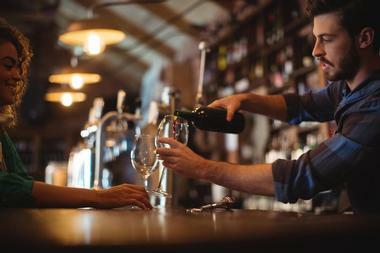 An award-winning wine list complements meals, along with local draft beer offerings, cocktails, and signature coffee blends. In addition to dinner menus, more casual lunch service is available Tuesdays through Fridays, offering selections such as salads and sandwiches. 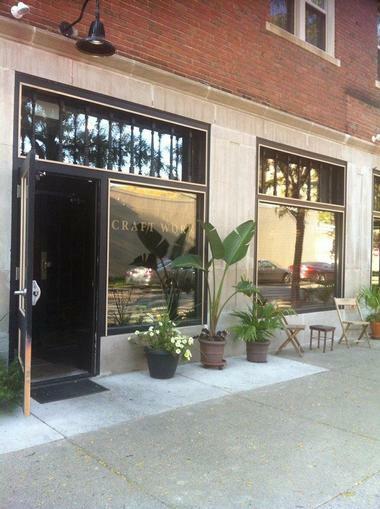 Craft Work is a New American restaurant opened in 2013 by Hugh Yaro and Michael Geiger in Detroit's historic West Village neighborhood. The restaurant's space includes a large bar area and outdoor dining patio offered in addition to its main dining room, which is lined with fully-stocked bookshelves. Its menu focuses on the use of high-quality ingredients, highlighting comfort classics such as craft burgers, fried chicken, and fish and chips platters alongside more adventurous gastropub fare such as roasted bone marrow. Craft Work also offers a raw bar, a drinks menu that includes wine and cocktails, and a variety of dessert offerings. 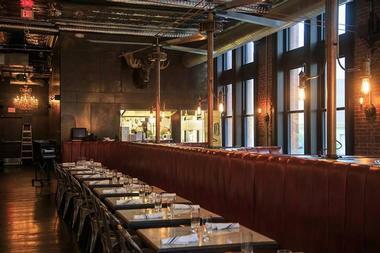 El Barzon is an upscale Mexican-Italian fusion restaurant that was opened in 2007 within the Southwest Detroit region. 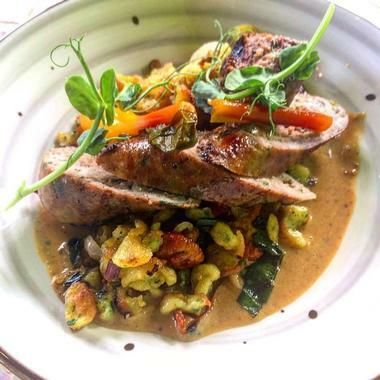 The restaurant, a venture by executive chef Norberto Garita, is named after a famed Mexican revolutionary song documenting the plight of farm workers. It is frequently named among Detroit's top restaurants, winning regional and national acclaim for both its Mexican and Italian dishes. Menu options are crafted from fresh, high-quality ingredients, ranging from Mexican favorites such as enchiladas to Italian specialties such as linguine. Seafood, veal, and chicken dishes are also served, alongside an extensive selection of tacos, a wide margarita menu, and a list of top-shelf liquor offerings. 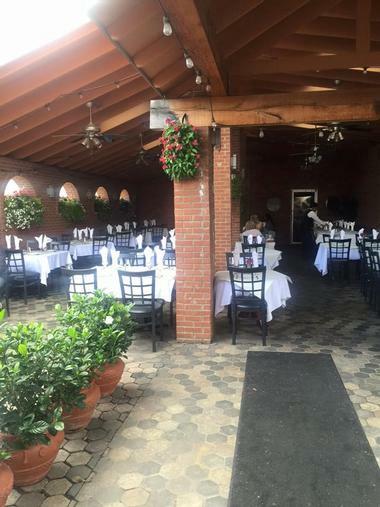 Andiamo is an award-winning upscale chain of local Italian restaurants founded in 1988, now offering eight full-service locations and pastry shops throughout the Detroit metropolitan area. The restaurant is dedicated to crafting dishes with the highest-quality ingredients possible in all of its authentic northern Italian cuisine offerings, which are presented in an elegant setting reflective of the country's dining traditions. 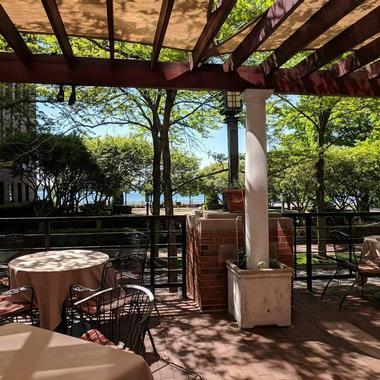 The Detroit riverfront location offers river views and connections to nearby entertainment, including shuttles to event venues and the ability to purchase dinner and ticket packages at a substantial discount. Menu offerings at all locations include traditional Italian pasta, chicken, steak, and seafood dishes, paired with an expansive wine and cocktail list and a variety of classic regional dessert options. 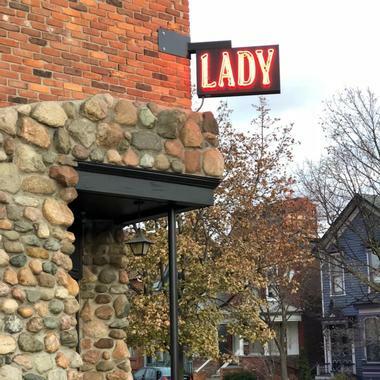 Lady of the House is an Irish-influenced New American restaurant that was opened in Detroit's Corktown neighborhood in late 2017 by executive chef Kate Williams, housed within a former Irish pub facility. Since its opening, the restaurant has received wide acclaim, including a nomination as a James Beard Award semifinalist for the prestigious Best New Restaurant award and an inclusion in Food and Wine's Best New Chef rankings. The restaurant is committed to the use of locally-sourced ingredients, partnering with several local farms and producers to craft frequently-changing brunch and dinner menus. All plates are sized to be shared, providing a perfect date night opportunity to split inventive gastropub dishes paired with wine and cocktail selections. 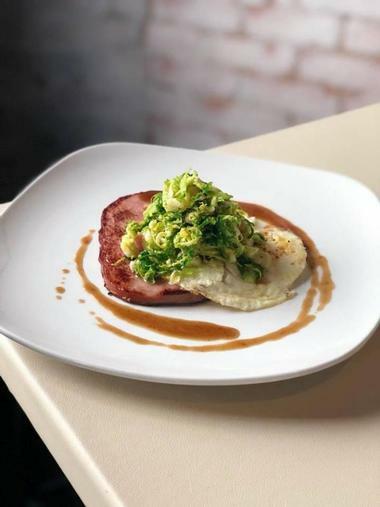 Chartreuse is a seasonal New American restaurant opened in 2015 by Chef Doug Hewitt and business partner Sandy Levine, located next door to the Detroit Institute of Arts within the historic Park Shelton building. The restaurant has earned the prestigious Restaurant of the Year award from the Detroit Free Press and is known for its dedication to the Detroit community, most notably in the form of its use of local artist works in its unique botanical decor and its sourcing of ingredients from local farms and producers. Lunch and dinner menus change frequently, but often focus on well-prepared seasonal meat and seafood dishes paired with vegetables. 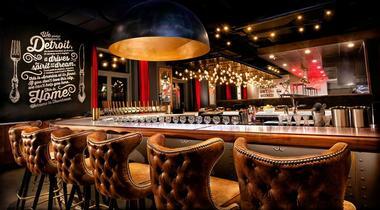 Extensive craft beer, fine wine, and creative cocktail menus are also served. Cliff Bells is an iconic Detroit jazz venue and nightclub, originally opened by entrepreneur John Clifford Bell in 1935. Throughout the mid-20th century, the club served as an anchor for Detroit's nightlife and music scene, operating under a series of business names in the 1960s and 1970s before closing in 1985. In 2005, the club was reopened by Paul and Carolyn Howard and Scott Lowell and has once again become a famed destination for live jazz performances in downtown Detroit, drawing local and national artists and receiving international accolades. Menu options at the club change frequently, but often include steak and seafood dishes, along with an expansive drinks list and brunch offerings served on the weekends. 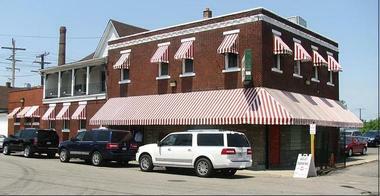 Amore da Roma is often cited as the oldest still-operating restaurant in Detroit. The establishment was family-owned for decades after its 1890 opening, operating under the name Cafe Roma, until changing hands and temporarily closing in for a few months in 2017 before its reincarnation as Amore de Roma, under the ownership of executive chef Guy Pelino. While the the restaurant has received updated decor and fresh visuals as part of its overhaul, the classic Cafe Roma menu remains mostly unchanged. 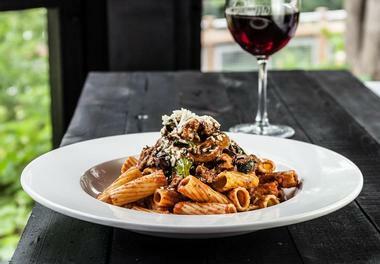 It serves brunch, lunch, and dinner seven days a week, focusing its menus on classic Italian fare such as veal and seafood entrees and homemade pasta dishes. An extensive Italian wine list is also offered, along with signature cocktails. Wright and Company is an award-winning restaurant opened in 2014 in the historic Wright-Kay building, managed by James Beard Award-nominated executive chef Marc Djozlija. The space blends the history of its 20th-century building with modern decor and is known for its beautiful floor-to-ceiling windows, industrial detailing, and large bar. The restaurant focuses on seasonal menu options and shared plates, with a drinks menu that highlights fine wine, cocktails, and an international beer selection. Visitors should note that reservations are only accepted at brunch and for parties of 15 or more, with all other seating available on a first-come, first-served basis. Joe Muer is a historic Detroit seafood restaurant that was reopened in 2012 as a revival of the classic Joe Muer restaurant, a local staple from its 1929 opening until its 1998 closing. The new incarnation has garnered local and national acclaim and is considered one of the best seafood spots in the Midwest. Its interior features decor inspired by styling trends that were popular during the height of the original restaurant's popularity in the mid-20th century. Its downtown location offers sweeping skyline views for diners complemented by menu options that include a sushi and raw bar, creative seafood dishes, and a selection of fine wines and cocktails. Shuttle service is offered from the restaurant to local sports and music venues, with valet parking also available. Ottava Via is an Italian restaurant opened in 2013 within a former Dime Savings Bank branch in the historic Corktown neighborhood. The restaurant is operated by David Steinke and Tim Springstead, serving daily lunch and dinner service and a full weekend brunch menu. It features outdoor patio seating with a large fire pit and bocce courts that are the home of community tournaments, with menus specializing in fresh, homemade Italian dishes, including stone-oven-prepared pizzas, pasta dishes, and home-cured meats. The restaurant's liquor menu is sourced from local brewers and distillers, offering a wide selection of fine wines, craft cocktails, and seasonal draft beers. Diners should note that reservations are not accepted during dinner service hours on the weekends. 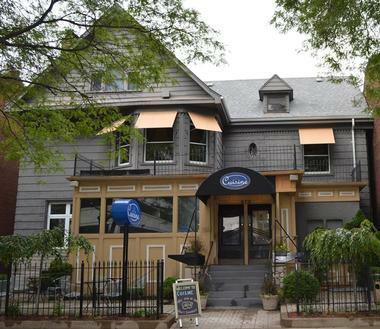 Savannahblue is a contemporary soul food restaurant opened in 2016, named both for the daughter of owners Roger and Tanya Heidelberg-Yopp and for the blue color that adorns its walls and decor. The cozy upstairs space is located in a corner building of Detroit's Times Square that is co-managed by Ron Scott and John Simpson. Its dinner menu features classic comfort and soul food options prepared in Detroit style, such as catfish platters, shrimp and fried chicken dishes, classic burgers, and homestyle mac and cheese. Southern-influenced such as grits, waffles, and hamsteak are also available at brunch. Savannahblue offers a well-curated wine list and cocktails prepared with house-squeezed juices, along with a selection of Southern-style desserts such as peach crumble. Vincent's is a Cuban restaurant opened by Vicente Vazquez in 2005, using family recipes handed down from Vazquez's mother, original head chef Maria Vazquez. The restaurant aims to bring a traditional Havana-style experience to downtown Detroit, highlighting a menu full of classic Cuban tapas, paellas, and large plates of poultry. 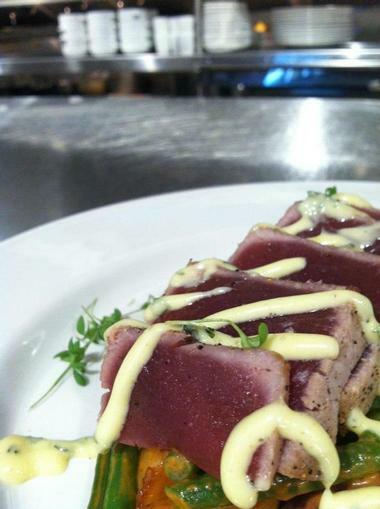 Meat and seafood entrees are also available, along with sandwiches offered during weekday lunch service. Signature Latin American-style cocktails are available, with a coffee menu served during all meals. Vincent's also serves as a popular downtown Detroit entertainment destination, offering live jazz music performances on Wednesday and Thursday evenings and salsa dancing lessons on the weekends. Cuisine is an upscale French-inspired restaurant located in a restored Midtown mansion, opened in 2001 by Le Cordon Bleu educated Chef Paul Grosz. The restaurant's dining area spans three small rooms on the main floor of the old house, with all rooms serving up a dedicated menu full of unique seasonal offerings paired with a carefully-curated wine list. Diners can choose to eat from the A La carte menu, which changes frequently but focuses on steak, duck, and seafood entrees, or choose from several chef-curated full tasting menus. A progression menu walks diners through six courses with wine flight pairings, while a vegetable tasting menu includes six vegetable-based courses that may be ordered vegan. A theater menu also allows after-show diners to choose between course options and shareable plates. Prism is the premiere fine dining destination restaurant at the Greektown Casino and Hotel, which has been in operation since 2007 and offers diners a view of the Detroit skyline paired with an award-winning menu and live music performances. 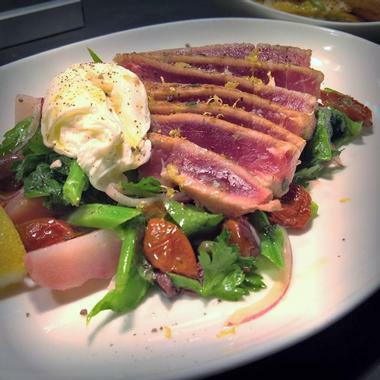 Prism is a 2014 replacement for the casino's former restaurant, Brizola, serving up a wider range of menu items than its predecessor, including pasta dishes and premium steak and seafood entrees. Shareable plates are also highlighted, such as the restaurant's signature seafood tower and steak for two options. A full bar menu highlights happy hour specials, with fine wines and craft cocktails served daily. An exclusive lighter fare menu is available to patrons choosing bar service instead of dining room seating, highlighting shareable bar bites and small plates.